Yeah...I'm writing a post about this girl. If you know anything (or have heard anything) negative about Jennifer Lawrence, I don't want to know. I have decided that, other than me, she will be my daughter's role model. I want to print out quotes by Jennifer and plaster them on my daughter's wall. 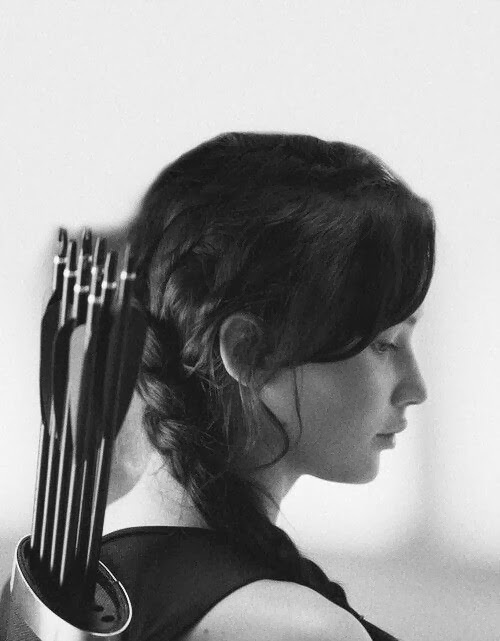 I want to get her Jennifer Lawrence posters as Katniss. I want her to know that Ms. Lawrence is someone to look up to. I have seen her on tv interviews, red carpet interviews, fall on her face, lift herself up again, read magazine articles about her, laugh off celebrity news about her hair, laugh and be pretty normal on screen. She takes on roles that are so different from each other. She seems like the real deal, huh? I wish I had known about someone like her when I was a pre-teen. So, she will be Lovebug's other role model. I'm her first, but I like to think that Jennifer Lawrence will help out when needed. Excellent role model. Love her! I love her! I would totally be friends with her if I had the chance. She's a great role model for children! I like her too. She is so goofy and doesn't take herself seriously. And she speaks encouragement to girls. Love it!